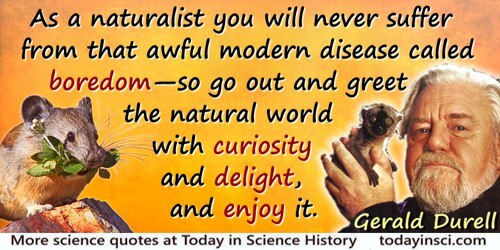 As a naturalist you will never suffer from that awful modern disease called boredom—so go out and greet the natural world with curiosity and delight, and enjoy it. But as the wilderness areas are progressively exploited or “improve”, as the jeeps and bulldozers of uranium prospectors scar up the deserts and the roads are cut into the alpine timberlands, and as the remnants of the unspoiled and natural world are progressively eroded, every such loss is a little death in me. In us. Letter (3 Dec 1960) written to David E. Pesonen of the Outdoor Recreation Resources Review Commission. Collected in 'Coda: Wilderness Letter', The Sound of Mountain Water: The Changing American West (1969), 150. If you want to achieve conservation, the first thing you have to do is persuade people that the natural world is precious, beautiful, worth saving and complex. If people don’t understand that and don’t believe that in their hearts, conservation doesn't stand a chance. That’s the first step, and that is what I do. Looking down on this great metropolis, the ingenuity with which we continue to reshape our planet is very striking. It’s also sobering. It reminds me of just how easy it is for us to lose our connection with the natural world. Yet it is on this connection that the future of both humanity and the natural world will depend. From BBC TV series Planet Earth II, while at London from the top of a skyscraper. As quoted in interview with Joe Shute, 'David Attenborough at 90: ‘I think about my mortality every day’', The Telegraph (29 Oct 2016). Many scientists are atheists or agnostics who want to believe that the natural world they study is all there is, and being only human, they try to persuade themselves that science gives them grounds for that belief. It’s an honorable belief, but it isn’t a research finding. In 'Oppressed by Evolution', Discover (Mar 1998), 83. Cited in Eugenie Carol Scott, Evolution vs. Creationism: an Introduction (2005), 67. Science is a method for testing claims about the natural world, not an immutable compendium of absolute truths. The fundamentalists, by ‘knowing’ the answers before they start, and then forcing nature into the straitjacket of their discredited preconceptions, lie outside the domain of science–or of any honest intellectual inquiry. Science is the way—a powerful way, indeed—to study the natural world. Science is not particularly effective—in fact, it’s rather ineffective—in making commentary about the supernatural world. Both worlds, for me, are quite real and quite important. They are investigated in different ways. They coexist. They illuminate each other. From transcript of interview by Bob Abernathy with Francis Collins on PBS TV program 'Religion and Ethics'(16 Jun 2000). Throughout all of human history, we have taken, taken, taken, from the natural world. All creatures, however large or small, do this as a way of making a living. Humans, though, have gone way beyond what elephants have done to the planet or what birds or what any fish in the sea is capable of doing. In interview with Pierce Nahigyan, 'Dr. Sylvia Earle: “We’re Literally Destroying The Systems That Keep Us Alive”', Huffington Post (6 Jan 2016). We are a plague on the Earth. It’s coming home to roost over the next 50 years or so. It’s not just climate change; it’s sheer space, places to grow food for this enormous horde. Either we limit our population growth or the natural world will do it for us, and the natural world is doing it for us right now. 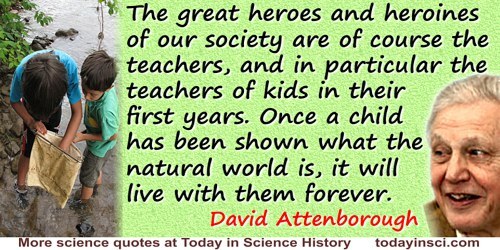 As quoted and cited from Radio Times in Louise Gray, 'David Attenborough - Humans are Plague on Earth', The Telegraph (22 Jan 2013). 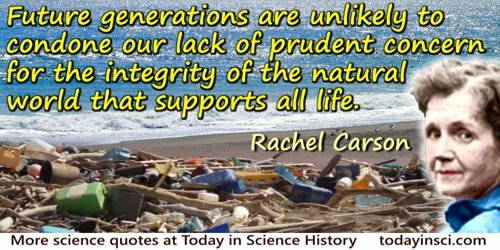 We must draw our standards from the natural world. … We must honor with the humility of the wise the bounds of that natural world and the mystery which lies beyond them, admitting that there is something in the order of being which evidently exceeds all our competence. In speech 'Politics and Conscience' written upon receiving an honorary degree from the University of Toulouse, delivered by Tom Stoppard because Havel was forbidden to travel abroad. First published in Czech, collected in The Natural World as Political Problem: Essays on Modern Man (1984). As translated by Erazim Kohák and Roger Scruton in Salisbury Review (Jan 1985), No. 2. [Am I vegetarian?] No. If you understand about the natural world, we’re a part of the system and you can’t feed lions grass. But because we have the intelligence to choose… But we haven’t got the gut to allow us to be totally vegetarian for a start. You can tell by the shape of our guts and the shape of our teeth that we evolved to be omnivores. We aren’t carnivores like lions but neither are we elephants. Interview by Simon Gage in 'David Attenborough: I’m not an animal lover', Metro (29 Jan 2013, London). [The natural world cleans water, pollinates plants and provides pharmaceuticals, among many other gifts.] Thirty trillion dollars worth of services, scot-free to humanity, every year. From transcript of PBS TV program 'Religion and Ethics' (17 Nov 2006).